Home Entertainment Balayya Girls Fans Sporting Huge Tattoos – Jai Balayya ! 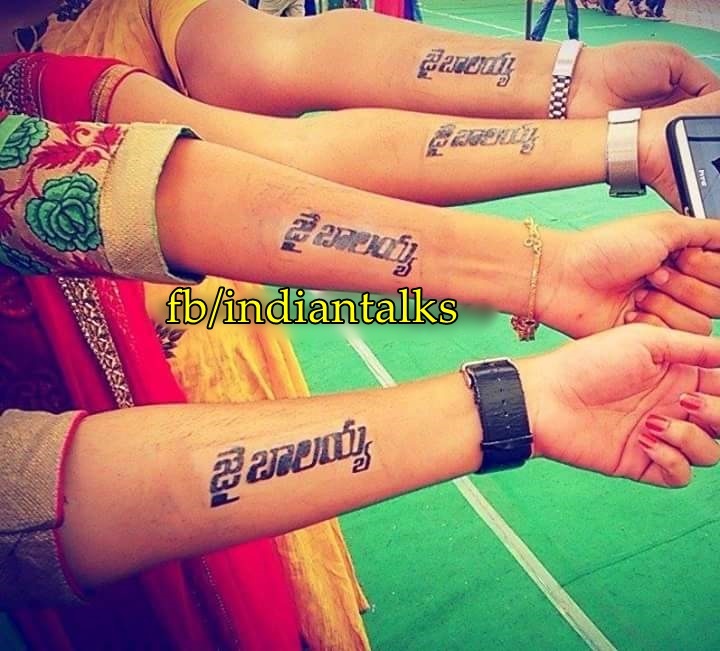 Balayya Girls Fans Sporting Huge Tattoos – Jai Balayya ! Tollywood Young hero Nani’s Krishnagadi Veera Prema Gadha has created a new sensation in the form of “Jai Balayya” tattoo. As our Nandamuri hero is a huge mass star, people may think that only his male fans will sport the tattoo. Here is a shocker.Today some girls have posted their pics on internet, showcasing their “Jai Balayya” tattoo. They are see inked with the name tattoo which happens to be a sticker that lasts for more than a week. Generally it’s a surprise to see girls loving Balayya tattoo and that proves how much craze the senior hero enjoys.Also all these girls are extending their full support to other Balayya babu fan, hero Nani, by watching his film.